Julie Reece's fantastic debut novel, Crux, is action-packed and has the sweetest romance I've read so far this summer! Birdie's anything but a meek girl ready to back down when faced with a challenge. No, she's the strong heroine readers dream of and she's ready and willing to take on an impossible task. Birdie's story is one of a kind. It only takes one moment for her life to change, for the better and the worse. She goes from homeless to college enrollment, and from alone to being surrounded by protective Grey Matthews and a new set of friends. For someone who doesn't have much faith in herself, Birdie learns to trust others and let them into her life. At first I thought Grey was going to be cold and dismissive, but he proved himself to be dependable and one of my favorite characters next to Birdie. With all her good fortune comes a role in history Birdie could have never imagined she'd partake. Inheriting a peculiar, powerful amulet makes Birdie a potential Wielder. The wielder of the amulet has a destiny intertwined with a historical battle between Viking King Thorolf and his son Haddr, who fights for the English. Crux is completely original and addictive. Birdie's voice is young and cool giving Crux a fresh tone that will appeal to all ages. 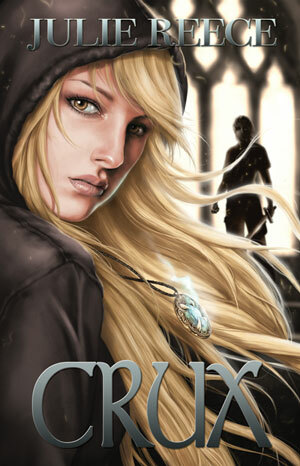 A fun romance and adventurous read, Crux will stay with readers long after the last page is read!